I got into New York yesterday afternoon, found the M60 bus, and made my way to the hostel. The plan today: a little morning Moksha Yoga to get my energy all fired up, a trip to Liberty Island, lunch at Pure Food and Wine, sight seeing at Rockefeller center, and dinner at an allergen-friendly Ethiopian restaurant. It’s going to be an awesomely busy day! Today’s restaurant review has absolutely nothing to do with me being in New York, but has everything to do with food, and couldn’t not be shared… so here goes. 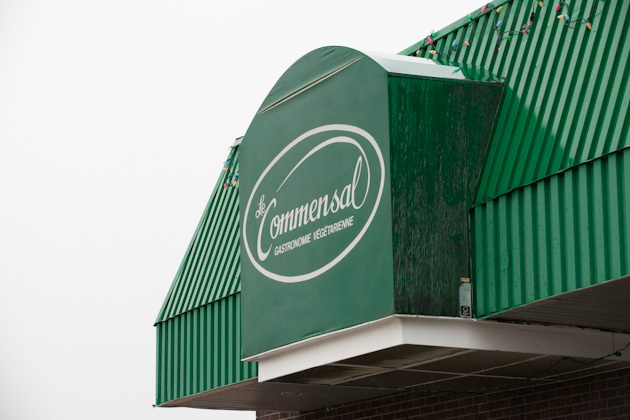 Commensal is a chain of restaurants in Quebec and Ontario that caters to the flexitarian eating style. 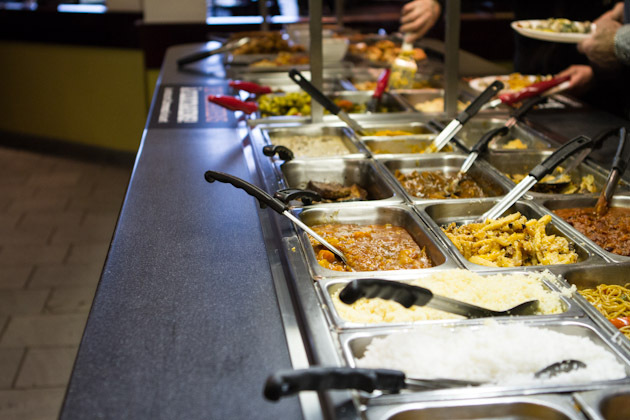 It’s a buffet restaurant so there is a potential for cross contamination, but they’ve done a pretty good job at keeping things easy and safe for us allergen-free folks. Okay, so you walk in the door of the restaurant and there’s this big sign. We were in Laval and; as I understand, Laval is ALL French so there was no English translation. 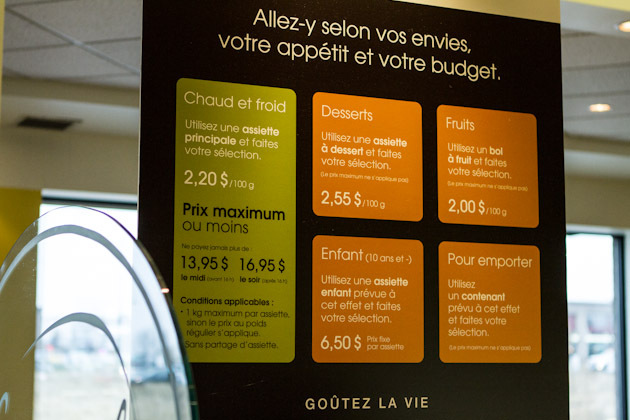 Pretty sure the sign says something to the effect of, ‘a meal for any budget’ and goes on to list that you’ll pay $2.20 per 100 gram up to $13.95 for… breakfast? and $16.95 for… lunch and dinner? Okay, how’d I do? Would I make my fourth grade French teacher proud? We ended up paying over $30 for our lunch so I’m thinking that my French to English translation is at least a bit accurate. Too bad you can’t just claim ignorance and make up your own price when you get to the register to pay. Heh. 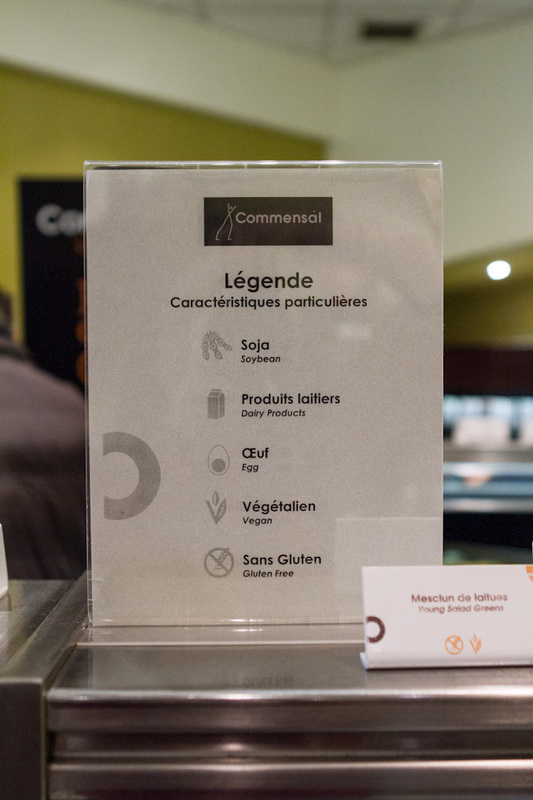 As you enter the buffet area, there is a smaller sign that explains the allergen information for the items before you. They indicate when soy, dairy, egg, and gluten has been used, in addition to noting which items are vegetarian. There are loads of different hot and cold options. I was able to find grain-free, gluten-free and dairy-free items and Kevin was able to find a good selection of goodies, too. One thing we both didn’t like was the amount of soy in many of the items. There were only a couple of meal items and salads that didn’t have soy and were also gluten-free. I would have loved to see beans or seeds being used as a protein source instead of tofu. What I liked was that each bowl had it’s own spoon, everything was very clean, and items were restocked quickly. Of course you still run the risk of someone dropping the nibbly bits from one bowl to another, so as a precaution, I just avoided the gluten-free items that were right next to a gluten-filled item. 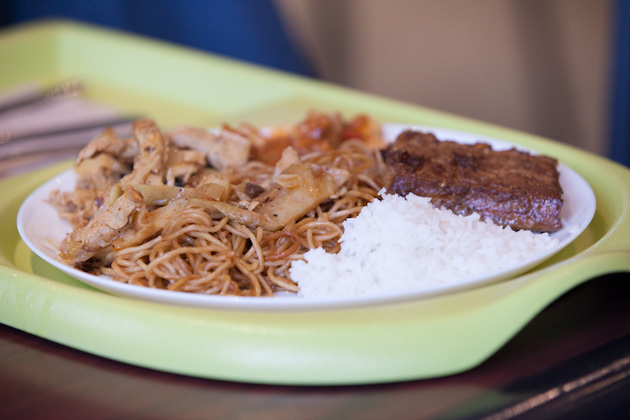 Kevin’s plate was packed full of rice, tofu steaks, chow mein, and baked tofu strips. You can see from the pictures of our lunch that we didn’t get too much food, but the total (with tax) came to $38.00. A bit steep for a vegetarian lunch. As I was taking pictures of our Commensal experience, one of the staff members came up to me and started yelling at me in French. She was speaking so fast that I couldn’t make out any of her words. I asked her nicely (in English) to slow down so that I could try to understand… but she didn’t. After minutes of feeling like I was being attacked; in perfect English, she said, ‘You cannot take photos in here’. Totally respect that we were in a French community, but really? I was in the wrong for not asking to take photos beforehand, but the staff could have approached the situation a lot better. 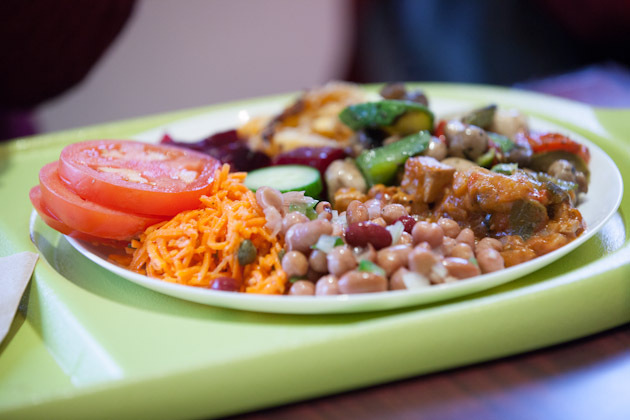 In short, the food was good – well seasoned and full of flavor, but the price, coupled with the extremely rude interaction that I had with the disgruntled worker left a bad taste in both of our mouths. If you’re looking for a vegetarian, gluten-free spot in Montreal and Commensal is your only option, check it out. 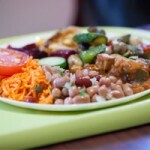 The food is good, but you’ll pay quite a bit and the energy of the place isn’t superb. 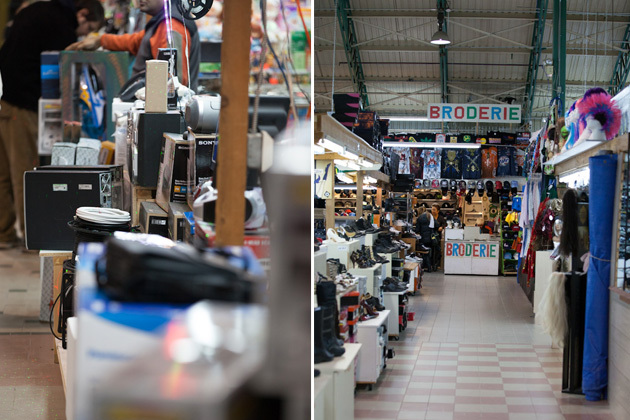 After lunch, we headed to the flea market down the road to search for some props for the blog. The place had lots of clothes, shoes and other personal items, but no kitchen things. 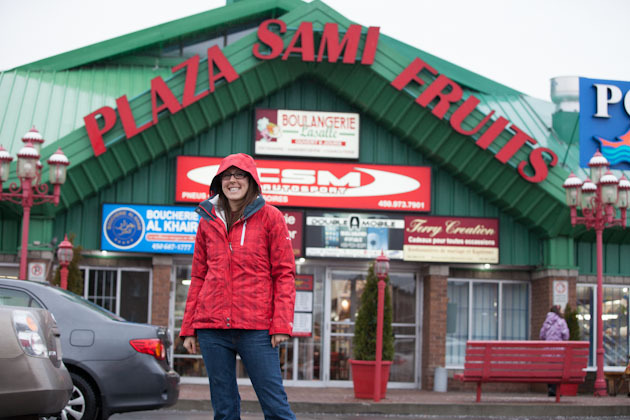 But we did find an incredibly large fruit & veggie grocer! Man, I wish I would have taken a picture of the place, the variety of produce was unreal! It was like nothing I’ve ever seen. I loaded up on clementines (can’t get enough of the baby oranges) and we made the trip back home to the island. 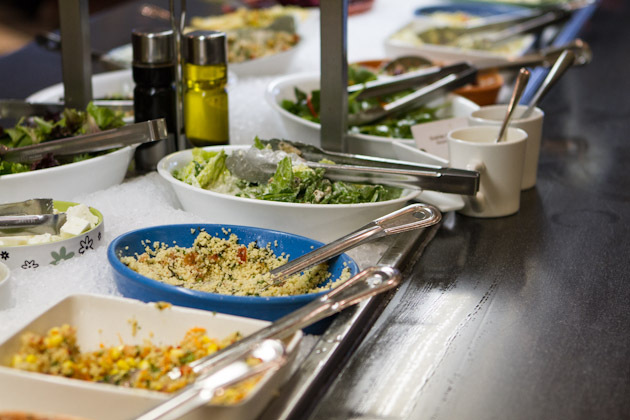 Do you like hitting up buffets for lunch?